Brighouse Town returned to winning ways in fine style with a 3-1 Evo-Stik NPL Division One North success at Radcliffe Borough. The result saw Paul Quinn’s side complete a league double over Borough having defeated them 2-1 in the first game of the season at St Giles Road. 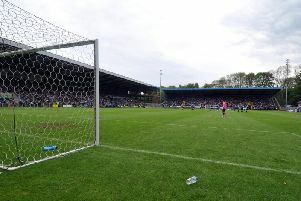 Ryan Hall forced the breakthrough after just nine minutes when his cross was turned into his own net by Radcliffe’s Danny Lafferty. The lead was doubled seven minutes later when Hall crossed and Danny Hull headed home. Borough rallied and Sam Cook pulled a goal back on the stroke of half time. Quinn made a double change on the hour with Leon Henry and Tom Matthews replacing Jason Davis and Martin Allison. Within 10 minutes Town were awarded a penalty for an offence which saw Alec Mudimu sent off, but Matthews saw his spot kick saved by the ‘keeper. Town were in no mood to let their advantage slip and Hall rounded things off in the final minute when he broke through the defence before slotting home.